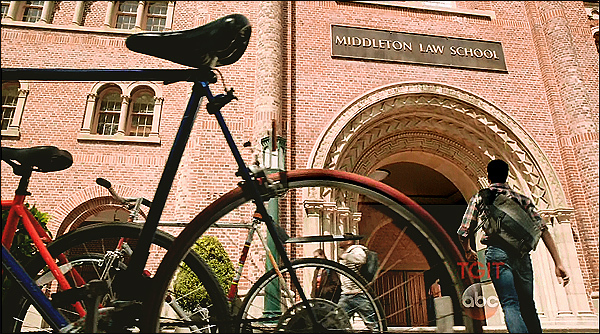 "How To Get Away With Murder" is filmed. 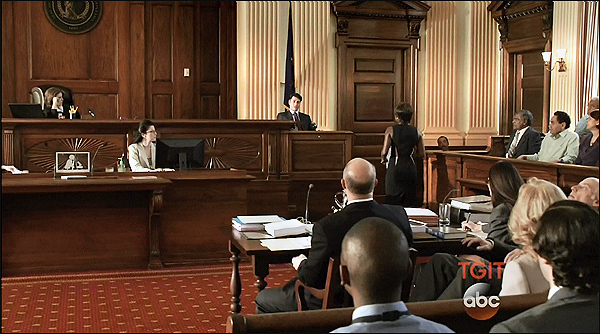 ABC's new hit show, "How to Get Away with Murder", is supposed to be set in Philadelphia. 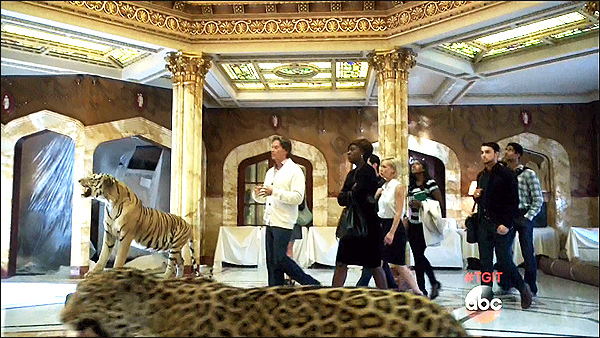 But like most TV shows, it wound up being filmed mostly in Los Angeles. This Victorian is a real home, built in 1895. But it's certainly not in Pennsylvania. just north of the USC campus & Exposition Park. It's on the south side of the 27th Street, at Monmouth Ave. 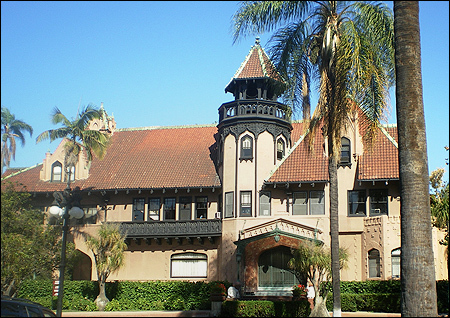 The "North University Park District is a five-block residential area developed between 1887 & 1929.
including the Doheny mansion, and is on the National Register of Historic Places. 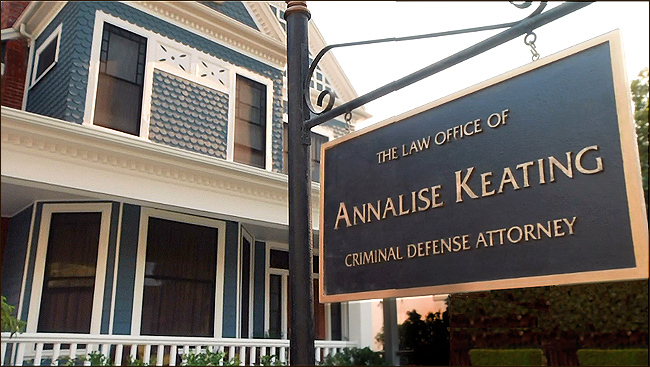 On the other hand, the interior of her law office/home, that we see on the show, isn't real. usually rather small - too cramped to make for an ideal filming environment. at Sunset-Gower Studios (where they used to film "Dexter"). 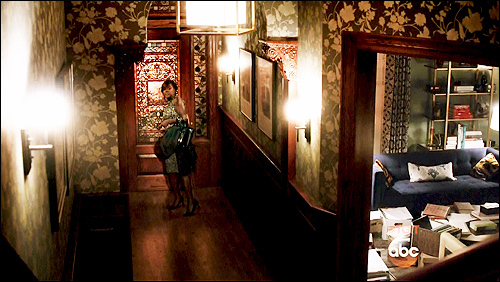 see on the show, plus the stairs leading up, the living room, etc. campus of what is supposed to be "Middleton University", in Philadelphia. at 3551 Trousdale Parkway, in Los Angeles. Tommy Trojan. The building seen behind him is the Gwynn Wilson Student Union. 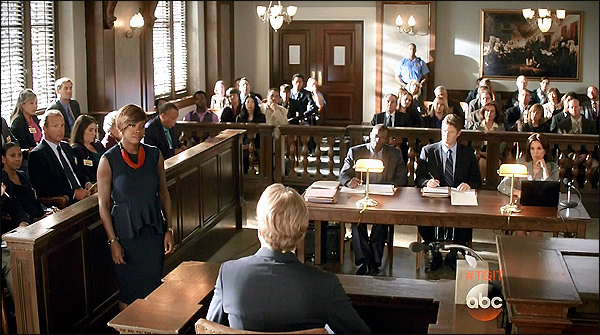 As you can see, it doesn't match the interior of Annalise Keating's lecture hall. 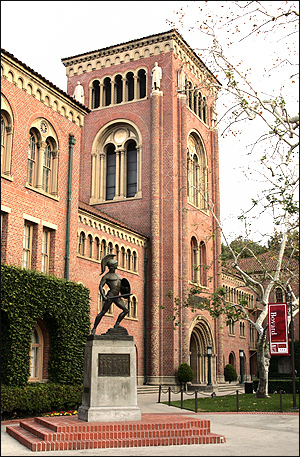 Here is a good Google Panorama of the same part of the USC campus. 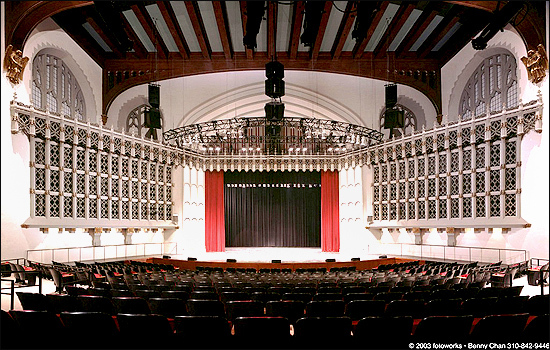 Bovard Auditorium, where exactly did they film them? send a film crew to the supposed location, shoot a brief "establishing shot"
Los Angeles location on a studio set in L.A. But this time, for some reason, they did the exact opposite. to shoot the interior of that introductory law lecture scene. They filmed inside Olin Auditorium, at Ursinus College, in Collegeville, PA. Even then, they had to build a set to make the stage look the way they wanted it to look. But the seats, aisles, etc, where the students are sitting, are all authentic Olin. They even recruited some Ursinus College students as extras to fill the seats. - except that the set doesn't have as many rows of seats as Olin Auditorium. scene of a murder: the mansion of the accused wife-killer, the wealthy hunter Max St. Vincent. St. Vincent tells them his side of the story, and then reenacts the bloody murder in his bed. 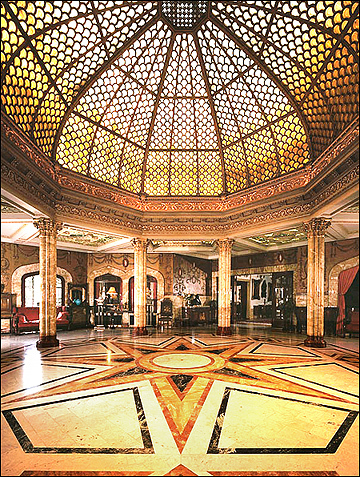 This is actually the Doheny Mansion, at 8 Chester Place, in Los Angeles. and is now part of the downtown campus of Mount St. Mary's college. half a mile northeast of the USC campus. Chester Place is a private street filled with Victorian mansions, located north of USC. This round, ornate room, with its dome & marble columns, is known as the Pompeian Room. "Princess Diaries", "Spider-Man 3", "Catch Me If You Can", "The Notebook"
"The Gilmore Girls", "Angel", "Sliders", "Murder She Wrote" and "Alias". sets that can be used for productions. But Riverfront actually has two different facilities. The first is called "Treadwell", and is located at 3061 Treadwell Street, in Atwater Village. which is located up north at 13100 Telfair Avenue, in Sylmar, CA. They used the same Telfair location for the hallway scenes outside the courtroom. 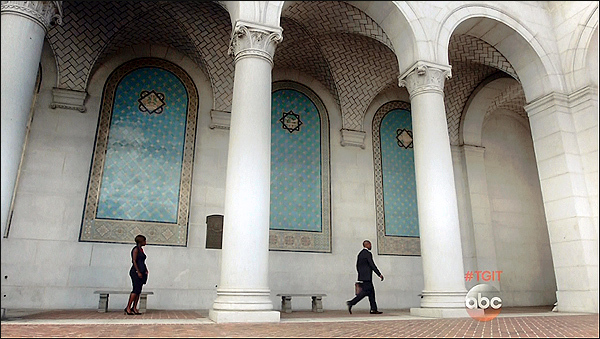 at 200 N. Spring Street, in downtown L.A. 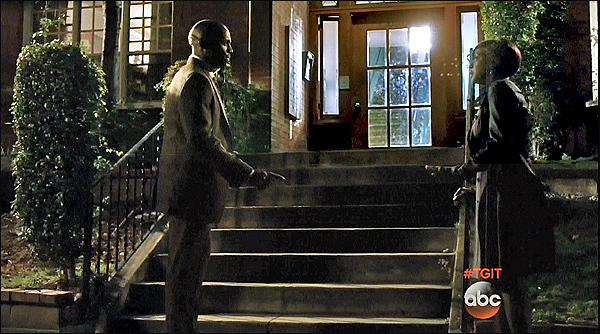 They shot this scene under the archways on the Hall's west side, facing Spring Street. see how genuinely worried she is, so he agrees to help. You'll find this apartment house at 642 N. Plymouth Blvd, in Hollywood. That's on a residential street just south of Paramount Studios. Here is a Google StreetView of the apartment house. 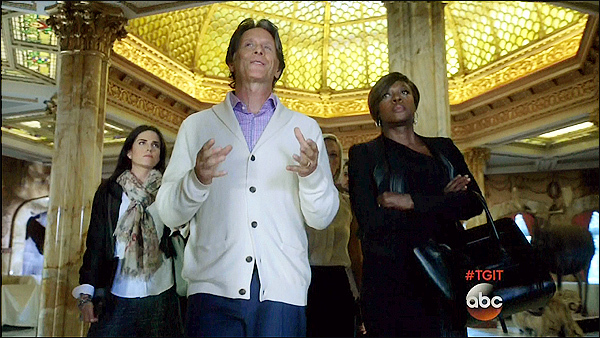 The screencaps on this page are stills from "How To Get Away With Murder"